Running along the Shirasaki coast where you can see the contrast between the ultramarine sea and the white limestone spreading along the coastline, you may feel like you are travelling along the Aegean Sea. The holy mountains, the blue shining seas of the southern area, a clear water stream and numerous amazing rocks of nature. Such abundant nature here became the fountainhead of ancient religion including world heritage sites such as Kumano 3 Shrines, Kumano Kodo and Mount Koya. Wakayama Prefecture is full of the pleasures of nature and culture. Furthermore, these natural and cultural areas are gathered together within reasonable distance, and it is the perfect area for a bike trip. Wakayama prefecture is located on the west side of the Kii Peninsula, which is the largest peninsula in Japan. Beautiful mountains of the Kii mountain range are lined up in Wakayama prefecture. 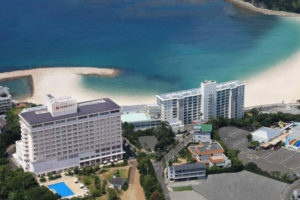 It is referred to as “The Land of Trees”, meaning there are many forests while the open fields are limited along Kinokawa city and parts of the coast. The Kise Main Line (Kinokuni Line) which forms part of JR West’s rail network runs parallel to the coastline of the Kii Peninsula between Wakayama Prefecture and Mie Prefecture. A direct express train, the “Kuroshio” service, also runs directly between Kyoto or Shin-Osaka and Wakayama area. The JR Wakayama Line also runs from east to west along the Kinokawa River. If you make a travel plan using the rail stations, why not go “Rinko style” (a Japanese term for carrying your bicycle onto public transportation in a carry bag)? You will have a lot of fun exploring around Wakayama Prefecture. Regional dishes of Wakayama Prefecture such as “Mehari Sushi” and “Kaki no Ha Sushi” (Persimmon Leaf Sushi) may be a good nutritional supplement during cycling. Wakayama Prefecture has the largest amount of production of mandarin oranges and “Ume” (Japanese Plums) in Japan. 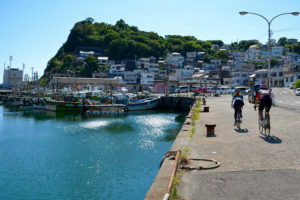 The prefecture is abundant in rich nature and has a good collection of fresh fish such as expensive rare fish called “Kue” (Longtooth Grouper) and “Maguro” (Raw Tuna) from the Katsuura Fishing Port, which is s a must-see during a cycle trip. 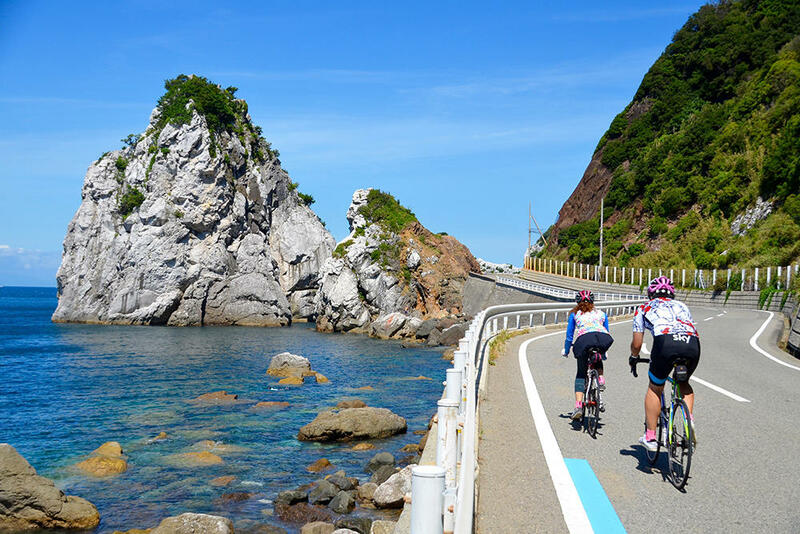 In Wakayama preference, a network of recommended cycling routes called the “WAKAYAMA 800” is currently being constructed, which are over 800km in length and includes various roads along beautiful mountains, rivers and oceans. Special blue lines have been painted on the roads, to mark the recommended cycling routes. Around the recommended routes, Cycle Stations are equipped with bike racks, pumps and tools. 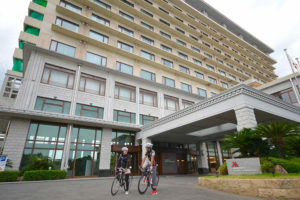 Aiming to become “The Cycling Kingdom of Wakayama”, this is an area with an increasingly exciting future.. 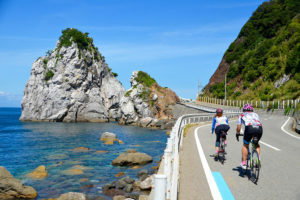 Although the recommended routes in the area of “Wakayama” here is based on the blue line route of the WAKAYAMA 800, each route has its own theme and stories as a unique plan of impressive bike trip. Avoiding busy main roads and long tunnels as much as possible, and utilizing trains effectively, our routes move dynamically from north to south or west to east in this large Wakayama Prefecture. “Arida Mikan” has the largest amount of mandarin orange production in Japan, while “Mikan no Oka” (Orange Hill) has switch back roads, which acts as a hill climbing course with superb scenery. “Daimon” with a height of 25m, is a symbolic gateway which is the main entrance to “Koyasan” (Mt. Koya) and the Daimon is the main objective of the Koyasan Hill Climb Course. “Aragi Shima”, is a fan-shaped rice field, which was made by using the river terrace formed by the Arita River. The river flows windingly around the fields, forming special and unique scenery. 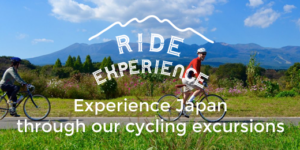 Having a long ride on the bike through Kumano 3 Shrines including Kumano Nachi Taisha, allows you to see of the best known waterfalls in Japan called “Nachi no Taki” (Nachi falls) with a drop of 133m. This bike trip will touch the heart of any cyclist. 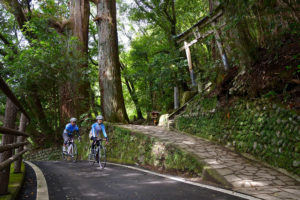 On the way of “Nakahechi”, the most famous of of Kumano Kodo (a series of ancient pilgrimage routes in Wakayama Prefecture), there is a part where you can ride a paved section of the Kumano Kodo by bike and experience the atmosphere of the ancient pilgrimage roads surrounded by mossy stone walls and gigantic trees. 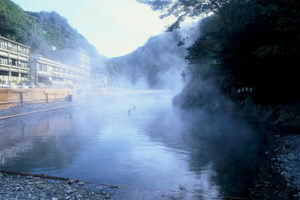 Wakayama Prefecture also features a great abundance of hot springs, which is good for cyclists and allows them to recover from exhaustion after they have been cycling. “Kawayu Onsen” (Kawayu Hot Springs) is an interesting hot spring, where hot water can spout out of the dry river bed if you decide to dig a section out of it. 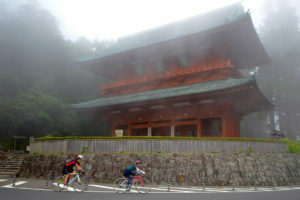 The hot spring has a “Ryokan” (a Japanese-style hotel) and this Ryokan is the perfect choice for cyclists on the Kumano 3 Shrines cycling trip. Cyclists are welcome at this hot spring. 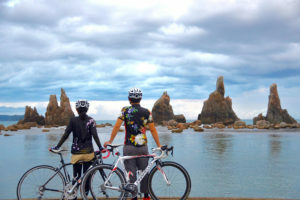 The “Hashikuiiwa Rocks” has about 40 large and small rock pillars along the Kushimoto coastline. These line up in a row at a length of about 850m apart. It is a place where you will want to visit at multiple times of the day, as well as multiple seasons. A monument of called the “Honshuu Sainantan” (Southernmost Tip of Japan’s Mainland)” is set up in Shionomisaki (a lovely area by the coastline), where you can overlook an expanse of the Pacific Ocean, and this is perfect place to take a souvenir photo. Along the Koza River, you can go over the “Myojin no Sensui Bridge” (Submerged Bridge) by bicycle, which has no guardrail and is designed to be underwater during a flood. The wonderful view of “Wako no Ura”, which is a registered Japan Heritage Site, will create feelings of romance upon looking at it. The cycling road on the lower reaches of the Kinokawa River on the right-hand side bank is very comfortable for cycling with wide, moderately winding roads. The distance to the end point of the route is written on the blue markers painted on the road, which are drawn in both directions. “Engetsutou” (Engetsu Island) seemingly floating by the beach resort of “Rinkaiura”, is a symbol of the area of Nanki Shirahama in Wakayama Prefecture. 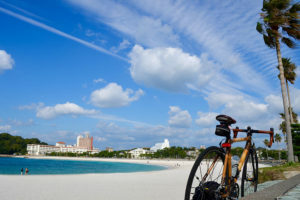 You can stop and see the best view of the island when you ride a bicycle.